Visit Norway Sports online at NorwaySports.com for a large selection of high quality outdoor, recreation and sporting good items. Norway Sports carries brands such as 66 Degrees North, Arc'Teryx, Asolo, Black Diamond, Camelbak, Cloudveil, Columbia Sportswear, Dale of Norway, Deuter, Gregory, Helly Hansen, Katadyn, Kayland, Lafuma, Marmot, Millet, Mountain Hardwear, MSR, NEMO Equipment, Optimus, Osprey and many more. Save on your next purchase from NorwaySports.com with discounts, coupons, promotions and savings from 58coupons.com. Free Shipping and Return Shipping on ALL Orders over $49.99 from NorwaySports.com. Click link to start saving. 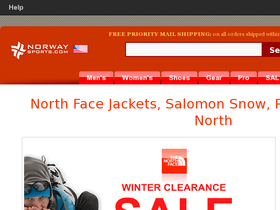 Save up to 70% on gear and apparel from NorwaySports.com. Click link to go to Outlet items. Sign-up for the Norway Sports Email Newsletter and get an extra 10% off on your next purchase of any one item.